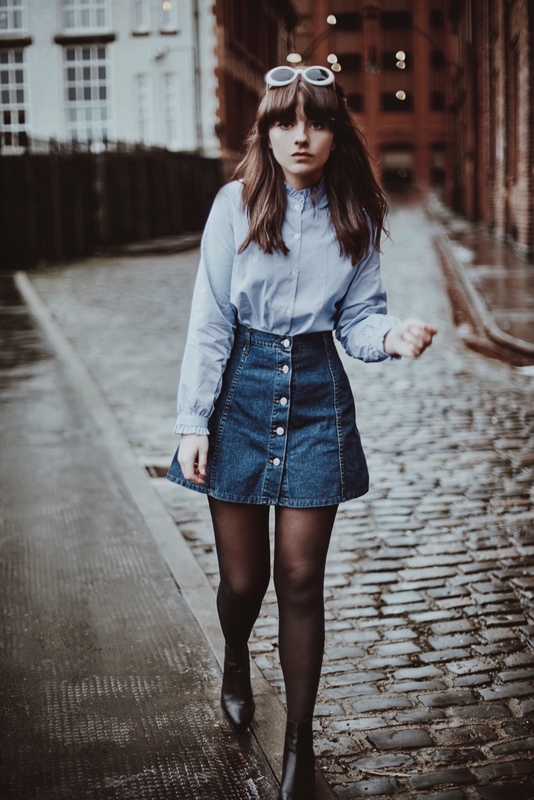 However , In 2016, the denim skirt seemed to be given a pedestal of it’s very own, I wore mine at least once a week, and found myself purchasing it in a few different styles/washes. 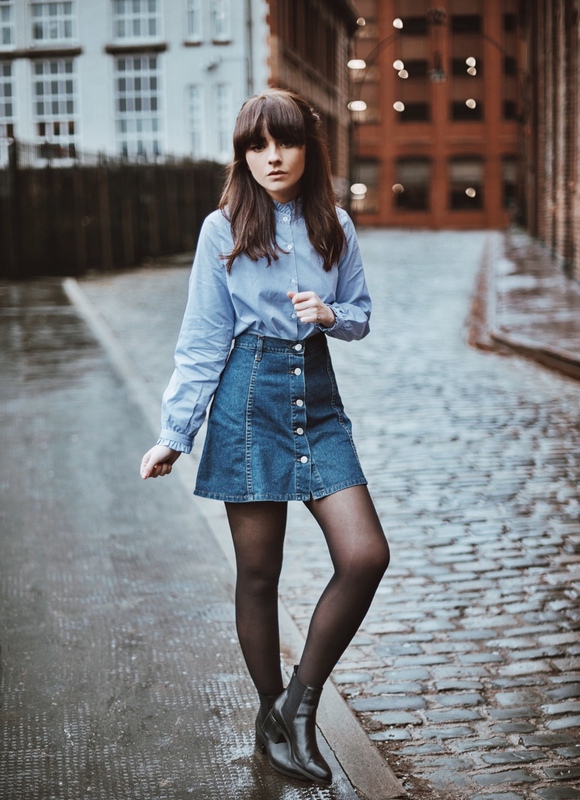 Everybody seemed obsessed with finding the ‘perfect little denim skirt’, and the A-line shape was taking centre stage. Don’t get me wrong, I’m still a huge fan of the classic A-line shape, but I have found myself reaching for it less and less, and instead, buying more jeans and trousers than ever before. 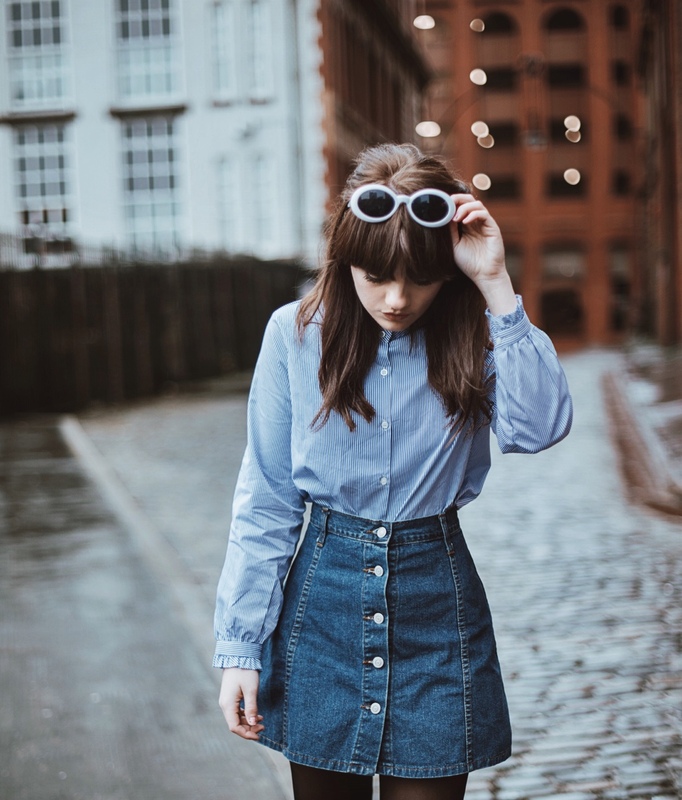 This was until I set my sights on this little vintage number – I’d forgotten how effortlessly cool a little denim button up skirt is, mine had been tucked away at the back of my wardrobe and I’d almost forgotten how much I love it. I instantly started picturing it with all the new blouses I’ve acquired recently and felt thankful for its existence. 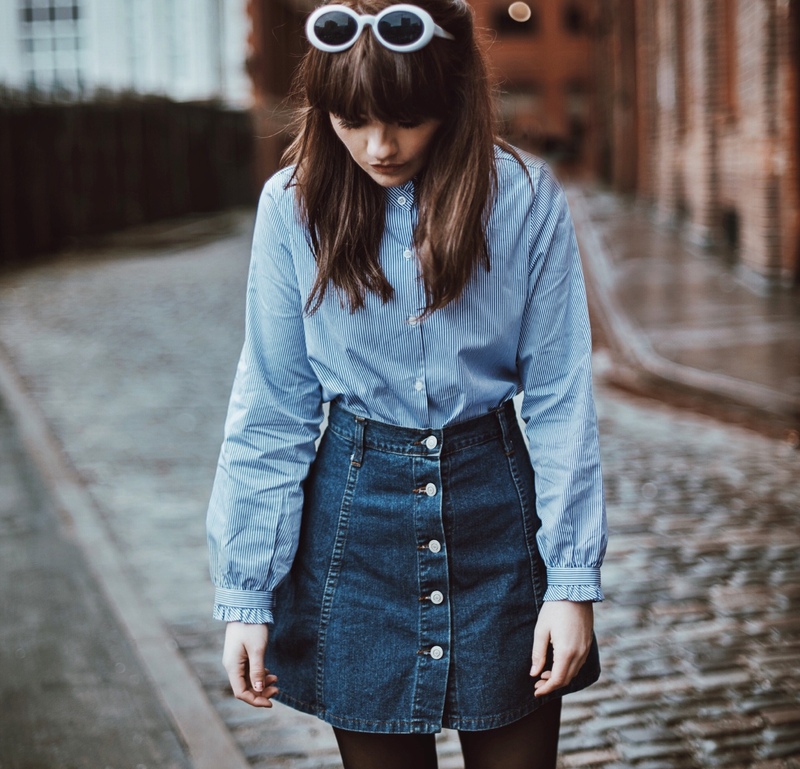 I literally live in a pair of Levi jeans – which can sometimes make me feel like I’m stuck in a bit of a style rut – I forget how nice it feels to wear skirt that nips me in at the waist and skims the top of my thighs. An A-line skirt will flatter every body shape and is one of those fail-safe pieces that can be dressed up or down relentlessly. 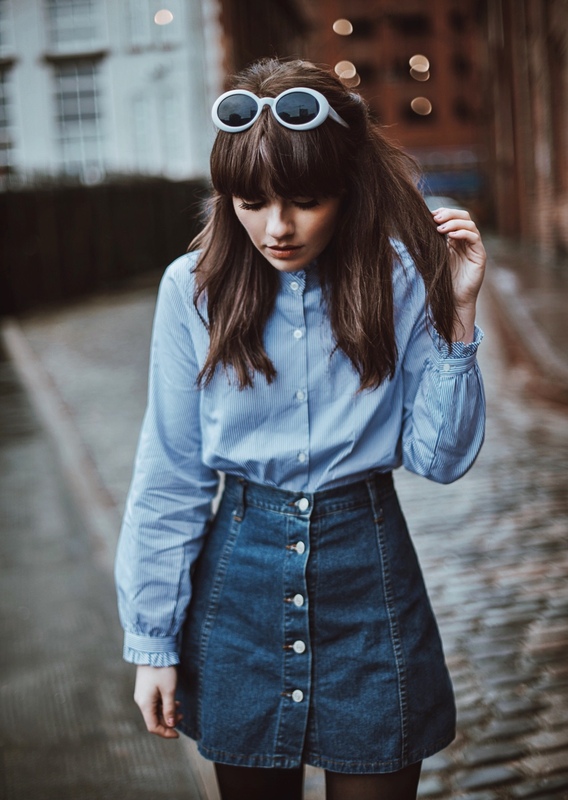 I love how it looks with this stripe blouse – the frills add that feminine edge, but the denim prevents the outfit from looking too ‘girly’, which is something I never feel fully comfortable with. I always feel my best between a mixture of masculine and feminine, and this is the kind of outfit that doesn’t leave me second guessing once I’ve left the flat for the day. Teamed with my new Chelsea boots, (did I really need more black boots? ), it’s the perfect weekday outfit. Lets face it, I need my trusty jeans by the time Saturday comes around. I’d really recommend these boots too if you’re on the hunt for a new pair – they are the perfect mash up of western and Chelsea, making them a little different to others in my collection. They are SO comfortable and haven’t hurt my feet once! Moving on from the outfit, I also just wanted to dedicate a little section of this post to my hair – I have an entirely love/hate relationship with it, and recently found myself quite fed up with how unmanageable it was becoming. On top of that, everyone who I had trusted to colour it had just made it darker and darker – resulting in a very washed out complexion and a lack of confidence. Funnily enough, I recently received an email from Melissa Timperley’s salon asking if I wanted to pay a visit so I immediately took up the offer and I’m so glad that I did! Melissa spent ages understanding exactly what I wanted, the colour that suits my skin tone, and the shape that enables my hair to remain manageable. Although it might not seem like a drastic change to anyone else – it feels back to its usual self, lifted in colour and so much nicer to style again. Maybe this will mean I’ll wear my hair in a bun less often?? For those of you who have been asking about the specific colours/treatments I had – you can find out all the details by dropping the salon an email – it’s located in the Northern Quarter of Manchester so I’d definitely recommend it if you’re central like me. I can’t imagine trusting anyone else with my hair now and it was lovely to have it done by someone my own age, with a similar outlook on both hair and life! I recently discovered your little blog and I love it! I’ve been making my way through all your old posts and have been so inspired by your style! You make great fashion so accessible and I really appreciate that. 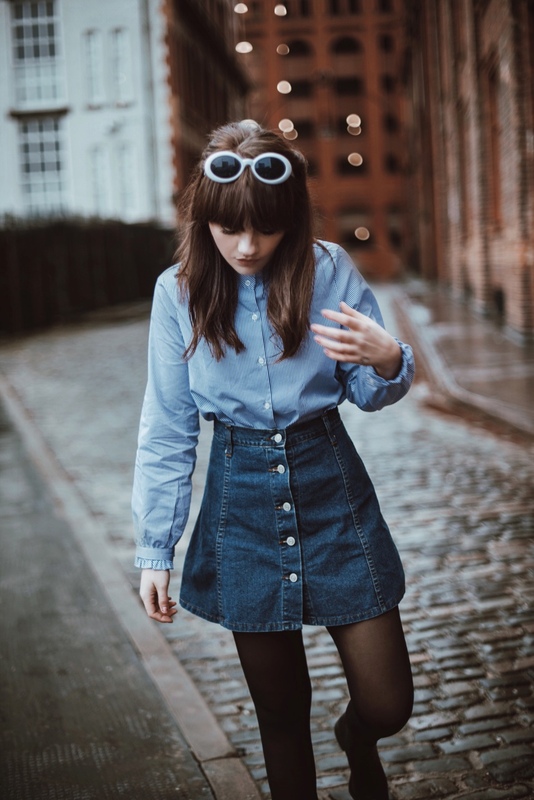 You have also totally inspired me to shop vintage more regularly and it just so happens that yesterday, I found a lovely little jean skirt just like the one you posted above at a vintage shop. Such a cute look 🙂 Thanks so much and keep it up!